It is disheartening but not unsurprising that Muslim women who choose to wear some type of head covering are rarely visible in American films, TV shows and news media. If Muslim women do appear, they are almost universally portrayed in a negative light: ISIS brides; veiled, black masses with no individuality; terrorists who hide bombs under their gowns; or oppressed victims of Muslim men. One positive media representation in recent months has been of Samantha Elauf, the young woman involved in the Supreme Court case that reaffirmed that she should not have been denied a job at Abercrombie & Fitch because she wears a headscarf. The photographs of Elauf, smiling and standing on the steps of the Supreme Court reinforce that she is a US citizen with the same rights to publicly express her religious convictions as a Christian, Jew, Sikh or any other American. Unfortunately, these positive images that show Muslim women as complex individuals with multifaceted identities and equal rights are few and far between in the mainstream media. Considering the long history of negative and Orientalist representations of “covered” or “veiled” Muslim women, it is not shocking to see some of the more recent appropriations of the face veil or niqab for political or cultural purposes. What is distinct in the current moment is the opportunity provided by the digital spaces for Muslim women to respond to offensive and ignorant representations and to share their own stories and images. The most recent Kardashian photo that has social media in an uproar is not an image of Kim’s backside, but instead a simple selfie that Khloe Kardashian took while traveling in Dubai. 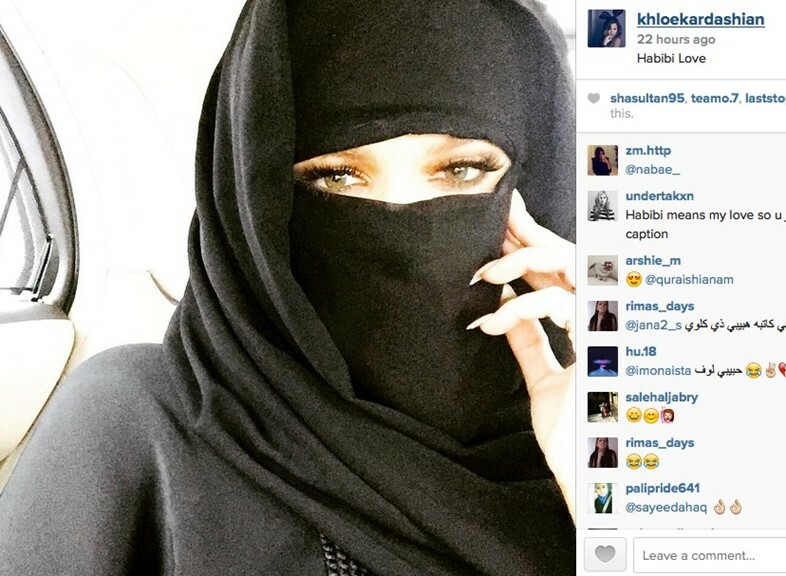 The image was posted on Instagram and features Khloe sitting in the backseat of a car and wearing a black abaya (long gown) and a black headscarf and niqab (face veil). Her green eyes stare at the camera and her manicured hand rests on her left cheek. The caption just says “Habibi Love,” with habibi being a popular Arabic term of endearment. This one photo received over 780,000 likes and almost 55,000 comments. Far too much virtual ink has been spilled on this one image, arguing that Khloe’s appearance in the photo is a racist form of cultural appropriation. Other commenters have defended Khloe and argued that she was trying to be sensitive to the culture by wearing the niqab. Some Muslim commenters even wrote Masha’allah, an Arabic expression of praise, to share their pride in seeing a celebrity wearing Islamic garb. Despite some of the defenders of Khloe, this image is offensive and ridiculous in many ways—namely, that Khloe would never have been required to wear a face veil in Dubai. Many people who commented on this photo, both Muslims and non-Muslims, made more complicated arguments about why this image and numerous similar appearances by other celebrities (Looking at you, Madonna!) are so offensive. @halleee.m a hijab isn’t just a piece of clothing in Islam and that’s the issue, that’s where you’re wrong. Hijabis get bashed for wearing it called a terrorist, there’s laws in France that have banned woman from wearing it. It’s wore for a reason and I personally don’t believe she knows the significance of the hijab. Yetttt she’s here getting praised for wearing it. @coltonsa there’s been quite a few Muslims commenting on this disagreeing with what khloe did for the same reasons as I disagree with it. Because like I just stated if a Muslim woman wore this outside she would automatically be labeled as a terrorist and would be judged but as soon as khloe does it it’s ok. Don’t you see how wrong that is?? It’s not fair to Muslims who are judged and disrespected daily for wearing this. Khloe Kardashian has gotten beyond embarrassing now. She needs to go educate herself. Muslim women don’t wear the Niqab to look fashionable. These commenters are arguing that Khloe is not just appropriating a cultural symbol in an insensitive way, but she is also directly subverting the meaning of the niqab and turning it into a fashion symbol and a sign of sexual availability. Furthermore, this sexualization of the niqab and headscarf has a long history that goes back to the European colonial paintings and photographs of the mystical harem space, in which the exotic Muslim women were unveiled for the male viewer. Malek Alloula wrote an extensive visual analysis of these images in his book The Colonial Harem. Khloe isn’t doing anything original here but is just tapping into an old visual trope of covering a woman’s body and only revealing part of it—usually, her eyes—to make the woman teeter between sexually desirable and completely unvailable. The majority of the feedback on Khloe’s niqab selfie came through written comments from both Muslims and non-Muslims, but another recent series of photos drew visual responses specifically from women who wear the niqab. In the end of May, several respectable news sites began running a series of photographs by AP photographer Hassan Ammar. These pieces featured phrases like “behind the niqab” or “what some Muslim women see.” Ammar captured images of various sites in Egypt and Lebanon while he held a piece of fabric over the camera lens to recreate what he said was the experience of seeing the world through a veil. Ammar does acknowledge in his reflections on the series that most Muslim women choose to wear the niqab, but he is still concerned about those women who are being forced to wear the face veil in places like ISIS-controlled Syria and Iraq. The assumption in Ammar’s short article and the photographs is that Muslim women are oppressed by Muslim men and forced to see the world through a hazy screen. While we certainly should be concerned with the atrocious crimes that ISIS members are committing against women and men, there are many reasons why Ammar’s photographic experiment is not a constructive way to combat these serious social injustices. First of all, it has to be said that many elements of this exercise are inaccurate and ridiculous. Most Muslim women do not see the world through a screen that turns their daily visibility into a dream sequence from a 1990s TV sitcom. The majority of Muslim women see perfectly fine because they don’t wear a face veil, and if they do, their eyes are not covered. In fact, some niqabi women even wear glasses because they actually want to see the world clearly! Second, this experiment recreates some of the same colonialist tropes as Khloe’s selfie. The images literally reenact the Western obsession with going behind the veil to reach this exotic and mysterious female space. In addition, the images play into the assumption, which Leila Abu-Lughod so clearly discussed in 2002, that Westerners need to save these veiled Muslim women from the oppression of their religion and Muslim men. Granted, the photographer is himself an Arab from Lebanon, but his images have circulated online under the theme that these photos will liberate Muslim women from the oppression of their religion. Furthermore, these images from “behind the veil” and the niqabi selfies reinforce how Muslim women are objectified in the public light and are minimized to one symbol–the veil. Miriam Cooke writes in an article about how the veil becomes a symbol of this collective, global identity of what she terms, the “muslimwoman.” Cooke explains that the body of the muslimwoman becomes an object to be fought over by both Western neo-Orientalists who want to rescue the women and by Islamists who want to use the female body as a boundary marker for Islam. The use of the veil in both of these images signifies the presumed oppression of all Muslim women, even though actual Muslim women are not present in any of these images. Finally, many Muslim women went online to express a concern about the hypocrisy of a male photographer sharing what it’s like to be a Muslim woman who wears a niqab. Several Muslim women responded by sharing their own reasons for wearing the niqab and posting photos that they took to illustrate how they actually see the world. 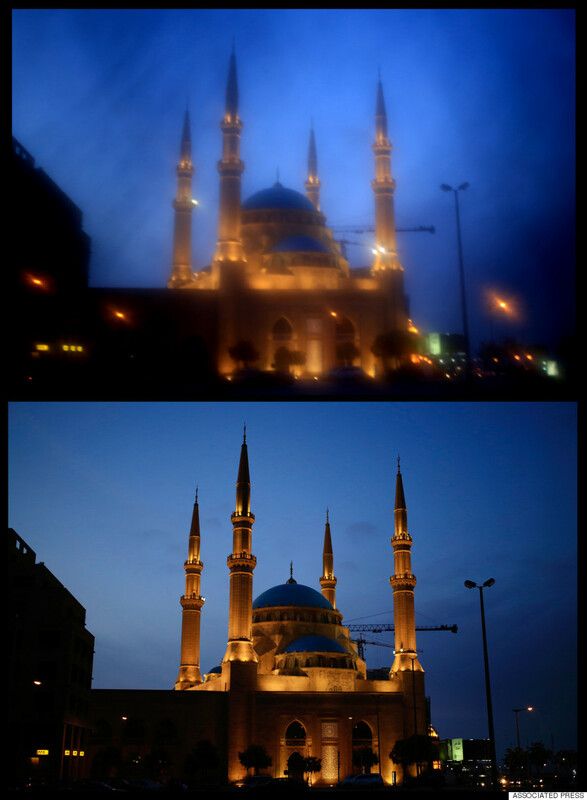 Not surprisingly, their images looked much different than Ammar’s photos. Writer Sana Saeed responded to Ammar’s article and photos by seeking out images and stories from women who wear the niqab. Saeed wrote about the responses she received, “Running throughout these anecdotes was a central theme: it’s frustrating to feel like you are being kept out of the very narratives that purport to be about you and your supposed ‘oppression.’” The images that Saeed collected showcase the daily lives of the women: their clothes, homes, food and a beautiful sunset. They live normal and fulfilling lives; they are not restricted by the niqab. In response to Ammar’s photos, Canadian writer Zainab bint Younus wrote several excellent pieces in the Huffington Post, BuzzFeed, and Medium. Bint Younus wears the niqab and identifies as a feminist and orthodox Muslim. When she saw the articles about Ammar’s photographs, she solicited self-portraits from other women who wear niqab. These images feature the women participating in various activities: playing hockey in the street, visiting the Harry Potter studios in London, wearing a Darth Vader mask at a big box store, riding a motor scooter, and jet skiing at the beach. Bint Younus also incorporated humorous captions into the images on BuzzFeed, making tongue-in-check comments about the presumed oppression of these women. We have our own voices, we have our own cameras, and we have our own stories that we can, will, and do tell – without needing someone else to do it for us. We play sports, we goof off in public, we go to the park, to cosplay conventions, pick out cute accessories for our niqabi outfits, and take selfies… basically, we’re human. The digital provides spaces for these women to express their complex identities and to contest dominant narratives about Muslim women. They are breaking out of the over-simplified assumptions that a woman who wears the niqab is oppressed and is waiting for liberation, but also that the niqab is a fashion accessory or a symbol of sexuality. At the same time that these women are rejecting the assumptions of oppression that come with the veil and the objectification of the “Muslimwoman,” the women in the images are also deliberately using the Muslimwoman label as a way to contest this identification. Miriam Cooke explains that some Muslim women have found it useful to create a hybrid identity of the Muslimwoman label in order to contest the dominant ideologies of both the Western neo-Orientalists and the Islamists. The niqabi women in these self-portraits deploy the identity of Muslimwoman and embrace the symbol of the veil in order to reject assumptions of their oppression. Yes, the women cover their bodies, hair and faces in mostly black material, but they illustrate their participation in contemporary culture by showing themselves comfortably existing in consumer spaces, playing sports, embracing popular culture, and expressing their personalities. This hybrid identity threatens the assumption that the veiled Muslimwoman is oppressed and cannot live in the modern world. Within the digital spaces, it is possible for Muslim women who wear the niqab to reclaim the narratives of their lives. Instead of looking at celebrity niqab selfies or photographic experiments, I encourage you to read what women who wear the niqab have to say about their lives and their reasons for covering. Look at the images that they choose to represent their lives. Ignore the efforts of others to speak for them from the imaginary space behind the veil. The script is similar on movie https://putlocker4k.me/16-shadowman-2017.html We must not rejecting religion and that is true.